0.88 oz 100% Pure Organic bourbon vanilla beans. 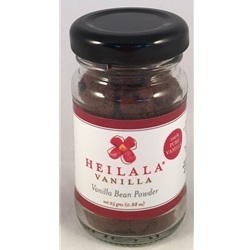 This vanilla powder is ideal for those who want rich vanilla flavor without the alcohol found in vanilla extract. Add it to frosting, sauces, ice cream, coffee, shakes & malts. To substitute for vanilla extract, use an equal part vanilla powder.